1Department of Veterinary Pharmacology and Toxicology, College of Veterinary and Animal Sciences, Mannuthy, Thrissur, Kerala, INDIA. 2Department of Veterinary Parasitology, College of Veterinary and Animal Sciences, Mannuthy, Thrissur, Kerala, INDIA. 3Department of Veterinary Pathology, College of Veterinary and Animal Sciences, Mannuthy, Thrissur, Kerala, INDIA. 4Department of Statistics, College of Veterinary and Animal Sciences, Mannuthy, Thrissur, Kerala, INDIA. The present study was aimed to assess the in vitro ovicidal, larvicidal and adulticidal activity of methanolic extract and its fractions from fruits of Piper longum against strongyle ova, larvae and adult amphistomes respectively. The fruits of P. longum was identified and the accession number 006 was obtained. The phytochemical analysis revealed the presence of tannins, flavonoids, glycosides, phenolics, diterpenes and triterpenes in extract and fractions of P. longum. The extract and fractions were diluted serially in 6.25 per cent tween 80 to obtain concentrations of 500, 250, 125, 62.5, 31.25, 15.63, 7.81, 3.91 and 1.95 mg/mL. Ivermectin and thiabendazole at 10 μg/mL acted as positive controls and 6.25 per cent tween 80 as negative control. The methanolic extract was highly active against ova with IC50 of 0.026 mg/mL. The n-hexane fraction was potent in inducing larval mortality with IC50 of 1.383 mg/mL while chloroform fraction inhibited larval migration with IC50 of 1.796 mg/mL. Amphistomes were highly sensitive for methanolic extract of P. longum which possessed IC50 of 5.493 mg/mL Based on IC50 values, the methanolic extract was found to be most potent while chloroform fraction was effective against ova, larvae and also adults. GCMS analysis of potent methanolic extract revealed the presence of piperidinone, hydrocinnamic acid, ethylhexahydro azepine, methyleugenol, hexadecanoic acid and caryophyllene oxide which may have contributed for the anthelmintic activity. The acute oral toxicity study revealed mild vascular changes in liver. From the present study, it can be concluded that chloroform fraction of P. longum possessed maximum broad spectrum anthelmintic activity comparable to controls. Keywords:Adulticidal, GCMS, IC50, Larvicidal, Ovicidal, Piper longum. Koorse KG, Samraj S, John P, Narayanan PM, SS D, PTA U, et al. 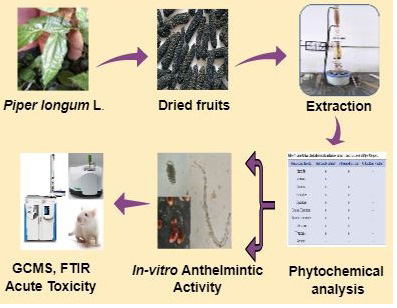 Anthelmintic Activity of Fruit Extract and Fractions of Piper longum L. In vitro. Pharmacognosy Journal. 2018;10(2):333-340.